Fotobokfestival Oslo welcomes you to a ten-day programme examining the photobook as an artistic medium and phenomenon through exhibitions, lectures, workshops and much more. Fotobokfestival Oslo 2016 also presents the shortlisted books from the Dummy Award Kassel (Fotobookfestival Kassel) and Nordic Dummy Award (Fotogalleriet, Oslo), and collaborates with different institutions in Oslo who have developed other programmes as part of the festival; Fotogalleriet, MELK Galleri, Fotografiens Hus and Tronsmo bookstore. We are proud to announce Fotobokfestival Oslo 2016 as host to Week 37, an annual event initiated in 2014 by Nordic Photography Network. With Week 37 as a starting point for this year´s Fotobokfestival Oslo, our main venue at Youngstorget presents exhibitions with a Nordic focus. With help from our network partners we have invited agents from Norway, Denmark, Iceland, Sweden and Finland to curate their separate containers. Nordic Dummy Award 2016 The Nordic Dummy Award is awarded annually by Fotogalleriet, in connection with the Fotobokfestival Oslo For the Nordic Dummy Award, artists with a connection to the Nordic countries submit their unpublished photo books to be judged by a jury that shortlists candidates and selects the winner. The chosen books can be seen during the Fotobokfestival and the winner book will be announced on Friday, 16 September. The winning book is published by Kehrer Verlag, Heidelberg in collaboration with Fotogalleriet. Nordic Dummy Award was established in 2012 by Fotogalleriet and Forbundet Frie Fotografer. Today the project is administrated by Fotogalleriet. The jury consisted of JH Engström (photographer, SE), Eva Eicker (Assistant curator, The Photographers' Gallery, GB), Klaus Kehrer (Director, Kehrer Verlag, Heidelberg, DE), Kristine Kern (Director, Fotografisk Center, Copenhagen, DK) and Marie Sjøvold (Photographer, NO). Festivalbutikk og café In addition to this, you will also find our festival book shop, where you can buy books from Fotogalleriet amonst others. Refreshments are available from our photo book bar. The Arctic region has evidently been a subject of exploration for many, but what is important in examining this region is that it is not only deeply influential and seismic for the rest of planet Earth but also a place of longing, capable of fulfilling utopian projections and culturally-driven adventures. The exhibition aims at taking a lyrical position in adverse to the grand mythical stories of the Polar explorer and the sober ones of the scientists by using the artistic lens as a means to interweave the diagnostic and analytical with the utopian and poetic. LED is a series of images of nature, photographed at night using artificial light, shot by Norwegian artist Bård Ek. By using artificial light, Bård wishes to highlight our distanced relationship to nature, as something beautiful to look at and a place for recreation. We act like we are not part of nature anymore. It becomes alienated and something we want to control. To save the environment and climate we now increasingly use the latest technology to manipulate and regain control. Bård investigates these borders between man made and nature. MELK is proud to show a new series of work by Lund Bø, opening at their new location in Waldemar Thranes Gate 51, August 18. The series Ping Pong Belong consists of photographs printed on cotton canvas. Selected colours from the photographs are painted on the canvas, as if suggesting an imminent painting yet to be made. Make sure you also stop by MELK book shop! During the Fotobokfestival Oslo 2016, Tronsmo will be open all week like always, so do come and spend some time in between all the other events on the programme. We are also happy to invite you to their photobook launch on Friday 16th at 17:00. The (so far) fairly unknown Oslo photographer Lise Holm is self-publishing her book Zoo Entrance, and they will host an artist conversation between her and the (not so unknown) Oslo photographer Morten Andersen. Tronsmo style refreshments, like always. 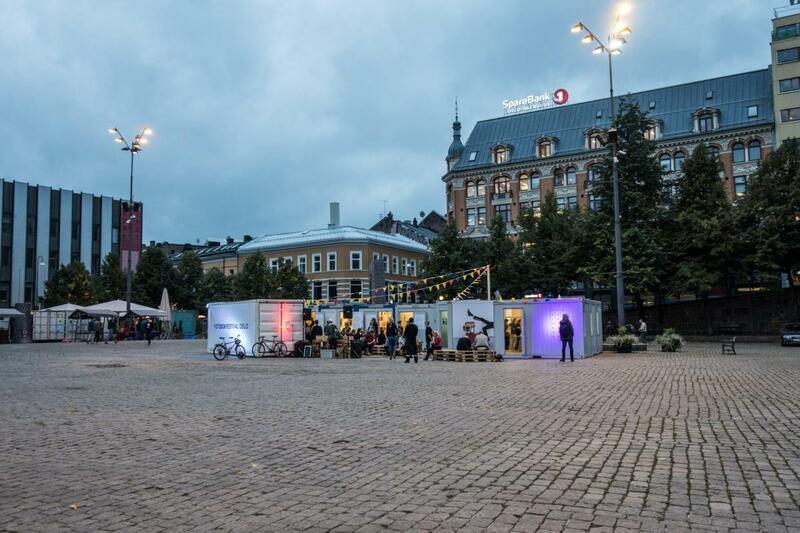 18:00 - 23:00: Youngstorget - Opening! 20:00 Offisiell åpning ved Byråd for Kultur, Idrett og Frivillighet; Rina Mariann Hansen. DJ utover kvelden. 19:00 - 21:00: Fotogalleriet - Opening: For a gentle song would not shake us if we had never heard a loud one. Helene Sommer, Jacob Kirkegaard, Janet Biggs, Katja Aglert, Lasse Lecklin, Mette Tronvoll, Tonje Bøe Birkeland, Ulla Schildt. Fotogalleriet 18:00-20:00 Performance and artist talk: Jacob Kirkegaard (DK) ”Isfald” in collaboration with Ultima Contemporary Music Festival/Ny Musikk. Artist talk with Jacob Kirkegaard and Anne Hilde Neset (Artistic director, NyMusikk). MELK 18:00 Book signing Mårten Lange "Chicxulub"
Fotografiens Hus 19:00-21:00 Boklaunch Bård Ek "LED"
Youngstorget 18:00-20:00 Book launch and signing Karina Sirkku Kurz – "Ungleichgewicht" (Nordic Dummy Award Winner ‘15) Emanuel Cederqvist – “Observatören” Johann Willner - "Wind upon the Face of Waters" Katja Aglert - "Winter Event-antifreeze" Madelen Isa Lindgren – “Victoria” Tonje Bøe Birkeland - "The Characters" Hallgerður Hallgrímsdóttir - "Hvassast"